Happy Friday! This week has felt so much more like summer and we are slowly getting into our summer groove. We're still having to wake up early for swim team each morning, but we are able to do some other fun stuff like swimming and spending time with friends. Despite the rain, we've been able to squeeze in some pool time and I feel like we've been living in our swimsuits and cover-ups. On Monday I shared some of my favorite swimsuits for our Share Your Summer: Making a Splash edition. A big thanks to all of you that linked up with us! Today I thought I'd share my search for a cover-ups. I haven't bought a new cover-up in what feels like forever and I think the last one I purchased came from Wal-Mart years ago. No lie. Usually when my cotton sundresses get older, faded, or a worn out I demote them from dress status to cover-up status in my closet. That's what I've been wearing to and from the pool or beach over my swimsuit. However, I feel like this year I want to purchase actual cover-ups. I like fun Ralph Lauren one because of the bright colors and the drawstring waist. This preppy nautical stripe cover-up might just be my very favorite one that I found. I have a thing for stripes! Since rompers are so popular right now, I kind of like the idea of a romper cover-up. And lastly, this Mudpie beaded cover-up would be perfect for me because it looks like a real dress. Sometimes I need to run a quick errand before or after the pool, so it is nice to actually feel covered and presentable. Those are, by far, way better than my last Wal-Mart purchase years and years ago. If anyone has any other cute ones they have seen, please leave me a comment and let me know! 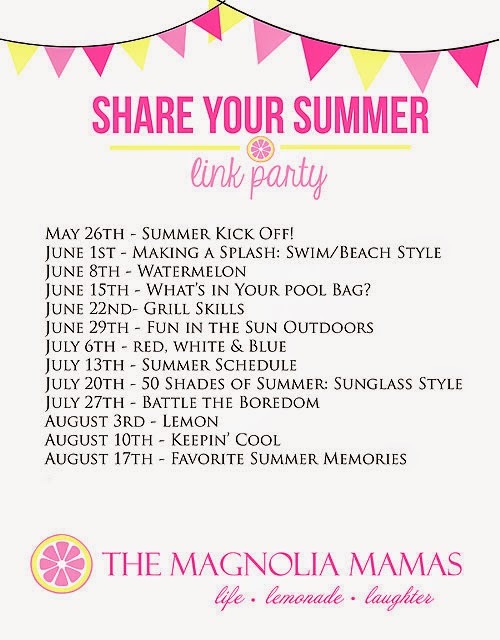 Be sure to check back on Monday for our next Share Your Summer linkup. We will be talking about all things watermelon! Nice list of swimsuit cover ups for summer. Check out also our page for more swimsuit cover ups.